On Wednesday, Feb. 28, one week after his death, Billy Graham's body lay in honor in the U.S. Capitol Rotunda. Only four civilians have been honored in this way. It was never about Billy Graham. That’s what the farmer’s son from North Carolina was always careful to emphasize as presidents, statesmen and regular American citizens sought his counsel decade after decade. Franklin Graham watches as Senate Majority Leader Mitch McConnell honors Billy Graham. 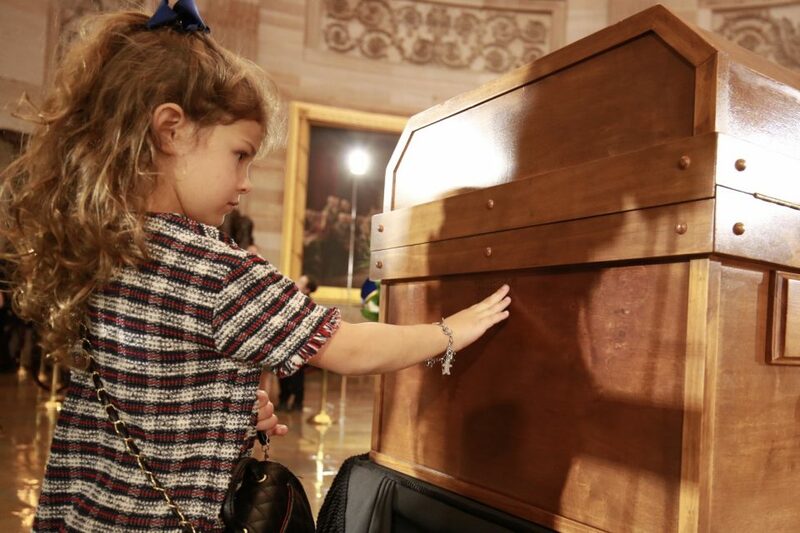 As thousands of people lined up outside the Capitol building to say goodbye to the evangelist who died peacefully in his sleep after 99 years of life, Mr. Graham’s simple pine plywood casket was carried up the steps by a military honor guard. 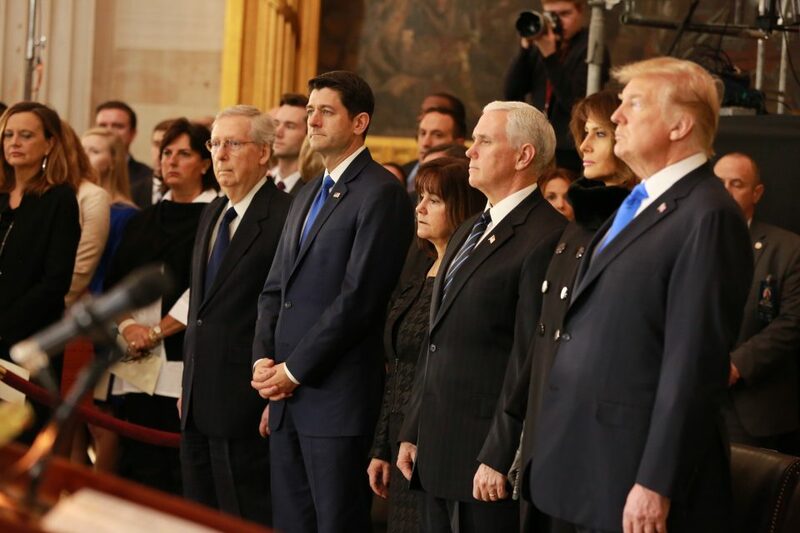 Inside the Capitol, President Donald Trump waited with first lady Melania Trump, Speaker of the House Paul Ryan, Sen. McConnell, and a host of diplomats and elected officials from both parties. 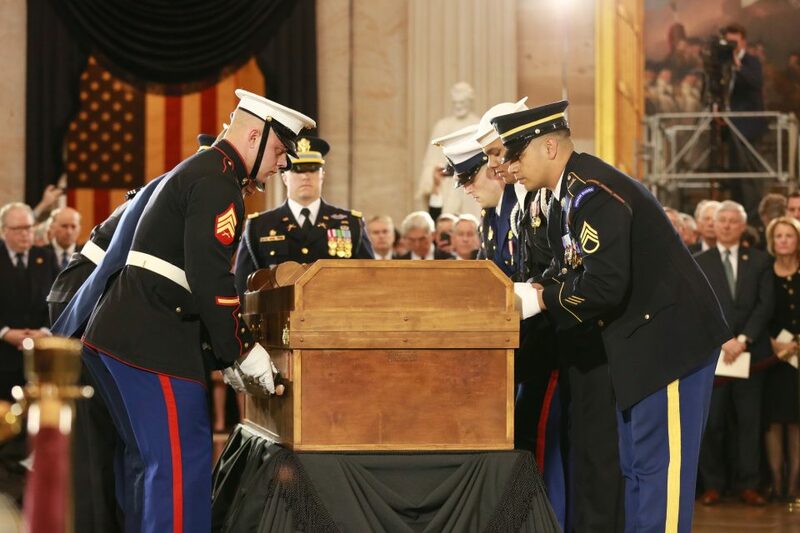 Just after 11 a.m., Mr. Graham’s casket was carried into the Capitol Rotunda and carefully placed in the center of the room, beneath the soaring, painted dome. At that moment, Mr. Graham became the fourth citizen in U.S. history to lie in honor inside the Capitol, in the same place where 11 presidents and a small number of exceptional Americans have lain in state. After an opening invocation by U.S. House Chaplain Rev. Patrick Conroy, McConnell stepped forward to speak. “At first blush, the life of Rev. 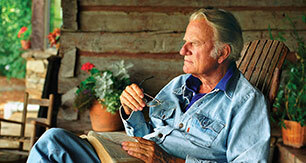 Billy Graham sounds like a personal success story,” he said. “A man-made success story for the ages. But the most remarkable thing about Billy Graham is that this isn’t his story. Ryan began his remarks with a Bible verse from the book of Matthew. Quoting Jesus Christ, he read, “‘Love the Lord your God with all your heart, with all your soul and with all your mind.’ (Matthew 22:37). 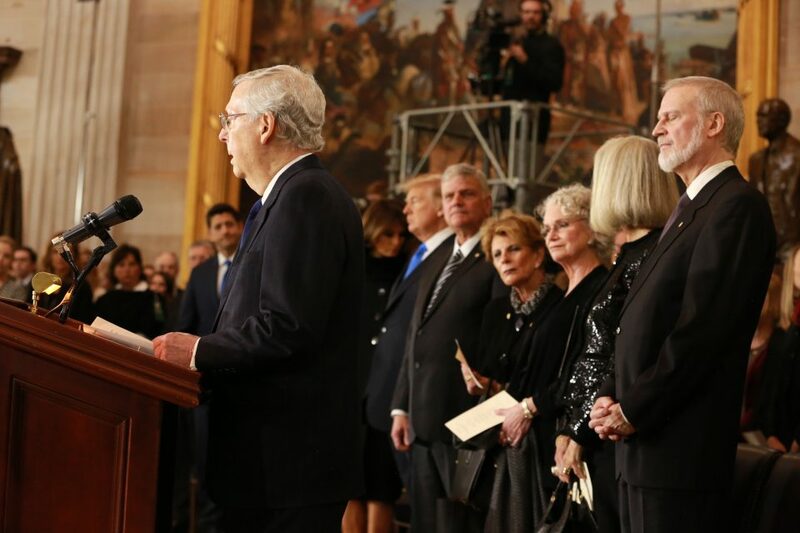 Senate Majority Leader Mitch McConnell, Speaker of the House Paul Ryan, second lady Karen Pence, Vice President Mike Pence, first lady Melania Trump and President Donald Trump stood as Billy Graham’s casket was carried into the Capitol Rotunda. As Mr. Graham’s casket lay in the center of the Rotunda, statues of American icons looked down from the outer edges of the room. President Dwight D. Eisenhower. President Ronald Reagan. Dr. Martin Luther King Jr. All individuals who forged friendships with Mr. Graham, who counseled the presidents and quietly bailed King out of jail when racial segregation was still rearing its ugly head. Throughout the ceremony, Mr. Graham’s five children watched, along with his grandchildren, great-grandchildren, nieces and nephews. Billy Graham’s great-granddaughter, 4-year-old Margaret Lynch, reaches out to touch his casket. Franklin Graham, his father’s successor as head of the Billy Graham Evangelistic Association, listened intently as he sat next to the president. “In the spring of 1934, Billy Graham’s father allowed a group of Charlotte businessmen to use a portion of the family’s dairy farm to gather for a day of prayer,” Trump began. “They prayed that out of Charlotte, the Lord would raise up someone to preach the Gospel to the ends of the earth. Trump recalled going to a Billy Graham Crusade at Yankee Stadium as a little boy with his dad in 1957. Mr. Graham was known for sharing God’s love all around the world, a feat made possible by the advent of radio and television broadcasts, and later by the internet—all tools used skillfully by Mr. Graham and his team throughout his 65-plus years of ministry. “His warmth and graciousness lit up living rooms,” McConnell said. The crowds of people gathered outside testified that God used Mr. Graham to bring them to their knees in front of flickering television screens. The evangelist’s goal was always to help bring people into a relationship with Christ, through prayer. Senate Chaplain Dr. Barry Black closed the short service with a moving prayer of thanks for Billy Graham. “Lord, we’re grateful for his scandal-free life of integrity, characterized by conduct that was above reproach,” Black said. The entire service embodied a thankful, joyful tone. Mr. Graham’s absolute dependence on Christ—and not on his own power or success—reassured many of those in attendance that death does not have the final say when it comes to this servant of God. Visit Billy Graham’s memorial website. 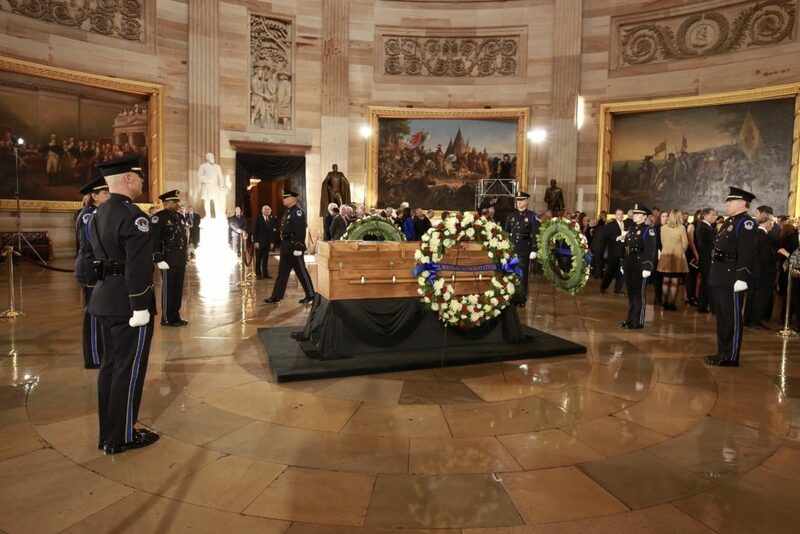 A military honor guard carefully places Billy Graham’s casket in the center of the Capitol Rotunda.